(MENAFN - Dubai PR Network) The story of the luxury brand AIGNER is a spell of passion, creativity and craftsmanship. The company was based in Munich, where the mood was one of excitement and a euphoric belief in progress. The free - spirited nature of the time influenced the company's direction and AIGNER went on to become a cult brand by virtue of its reflection of a life of pleasure and savoir vivre. The company chose wild horses as its symbol, as it chimed with the atmosphere, materials and designs that defined the company, as well as the luxury of upmarket horse culture. The horseshoe became more than just a decorative symbol it represented everything that the company believed in. Luxurious leather bags carrying the famous horseshoe shaped ‘A' are at the core of the brand. Together with Swiss Made timepieces and accessories, AIGNER is a timeless expression of German precision and Tuscan tradition. 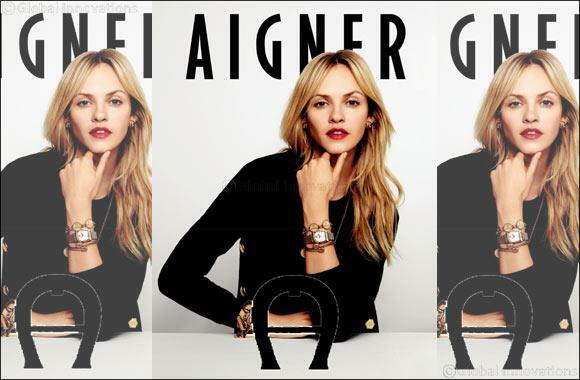 The master touch of AIGNER resonates in every product of the brand, making AIGNER a class apart. A beautiful filigree design encompasses the surface of the mother-of-pearl dial of the gold plated timepiece. The iconic AIGNER horseshoe renders its magic to the timepiece that has AIGNER ‘A' logos housed within the filigree design. With golden studs in the indices and a striking crown, the Swiss made CESENA is thoughtful, creative and makes for an unforgettable gift. The iconic horseshoe undergoes a three-dimensional metamorphism to give way to the classic round case that has the AIGNER logo emblazoned on the bezel. The dial is a delightful sundry of aesthetic details that are functional and stylish. The AIGNER logos etched on the dial lend flamboyance to the timepiece and are balanced by the smart bracelet and leather strap. Equipped with a date counter, the dial is also highlighted by the seconds' window that is housed within the AIGNER logo at 6'o clock position. Edgy, sporty and raging ROMA is a timepiece that is destined to complement a man who is fashion conscious and adventurous. A vibrant palette that harks to every fashion demand possible, Roma has an interesting play of textures and colours adding to its overall appeal. With the AIGNER logo at 12'o clock position and a smart date window, the timepiece achieves great functionality, which complements its sleek and defined silhouette. Often called one of the most beautiful cities in the world, Venice is profoundly recalled as one of the most romantic places on the planet. The city, enveloped by azure waters and quaint architecture plays the perfect backdrop for the new AIGNER timepiece VENEZIA. This beautiful jewellery has an aura of mystery around it the perpetual interlinking loops ends in a dramatic pendant that further the magical appeal of the jewellery. The AIGNER ‘A' logos seamlessly blend into the design while creating an illusion of eternity. The necklace also comes with matching earrings and bracelet that boast the same filigree design of the necklace. The filigree reveals a gleaming mother-of-pearl surface surrounded by Swarovski crystals, which shimmers and shines just like the AIGNER woman. Sometimes an accompaniment to your timepiece, sometimes a style statement — AIGNER bracelets are a revelation to men's fashion. A playful assortment of leather and metal, the bracelets are primed and polished to create a new trend in wrist fashion. Elegant and masculine, this sophisticated pair of cufflinks are the ideal fasteners to complete any ensemble. The AIGNER 'A— symbolic of classic style, modern innovation and quality craftsmanship—is placed at the center of the cufflinks to enhance the radically stunning combination of black and silver.